The amended report was supported by all political groups – the only two opposing votes were cast by MEPs from the far-right French Front National. In this report, the Parliament recognises that copyright reform is urgently needed not just to improve the Digital Single Market, but also to facilitate access to knowledge and culture for all people in Europe. 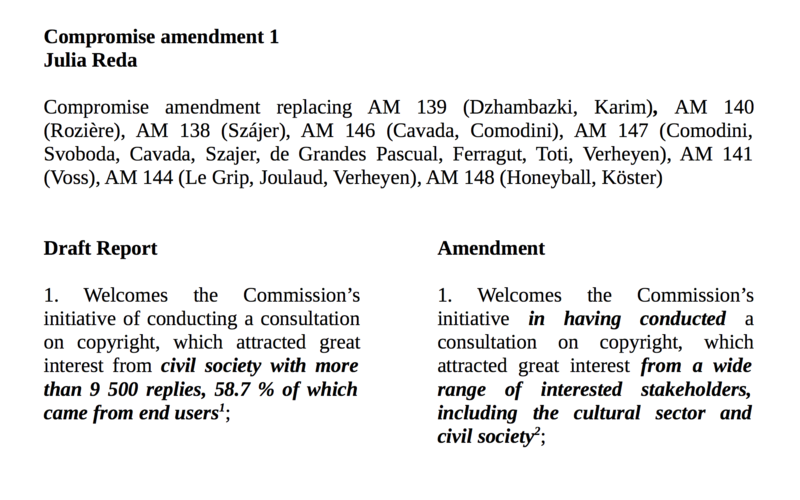 It calls on the Commission to consider a wide variety of measures to bring copyright law up to speed with changing realities and improve cross-border access to our cultural diversity, going further than the plans so far announced by the Commissioners. The report marks a turning point: After decades in which the focus was on introducing new restrictions to protect the material interests of rightholders, this is the strongest demand yet to reconsider the rights of the public – of users, cultural heritage institutions and scientists, and of authors who build on what has come before. It is a call to reduce the legal uncertainty Europeans face in their everyday online interactions with copyrighted works today – while at the same time also protecting creators from exploitation. Its proposals, if implemented, will have no overall negative effects on the livelihood of creators, but greatly increase everyone’s ability to participate in culture and education. to allow the automatical analysis of large bodies of text and data (text & data mining). At the same time, reaching broad agreement on the report came at a cost. It proved impossible to build a Parliamentary majority for several common-sense reform ideas demanded by the vast majority of respondents to the public consultation the EU conducted last year and supported by scientific research and expert assessments. The report no longer calls for making all exceptions mandatory across the EU, which would have prevented rights of Europeans to interact with copyrighted works from ending at national borders. There was no majority for a flexible open norm, which would have allowed the legislation to cover future developments unforeseen today. Instead of meaningfully reducing copyright terms, which would have curbed the “20th century black hole” effect where a large part of our recent cultural history has become unavailable because it is no longer commercially viable yet still protected. The Committee could only bring itself to reject any further extensions in copyright terms, and to eliminate national additions to the copyright term, such as the 30 extra years that France awards to the works of war heroes. Works created by governments will still be subject to copyright, supposedly to protect them from the sovereign who financed their creation. Instead, the Commission is only asked to simplify their re-use. The big political groups not only turned their backs on these ideas that enjoy vast public support according to the consultation – they specifically insisted that the mention of the unprecedented number of responses by end users be deleted from the report. This was the most successful political participation effort on copyright issues ever – and we must keep reminding politicians of the results. It is unacceptable that so many voices are ignored. The necessity of compromise also resulted in a significant weakening of the language in the report. Where my draft report made bold demands, the final version now frequently just asks the Commission to assess certain ideas. Unfortunately, this does not set up the Parliament as a strong player in the upcoming debate on the legislative proposal. The Committee also narrowly rejected an amendment that called for allowing audio-visual quotation in every member state, extending this right beyond textual quotes to other forms of cultural expression. As a result, YouTubers and podcasters who use quotes may remain outlaws and common practices on the web today like reaction GIFs will still be illegal in many countries! Had the two GUE/NGL MEPs not abstained from this vote, the amendment would have passed. The shadow rapporteurs representing the EPP and ECR groups together with 11 further MEPs filed five amendments all seeking to delete any positive mention of the public domain – our common cultural wealth made up of works unprotected by copyright, or for which protection has lapsed. The final report maintains a strong call for safeguaring the public domain and ensuring that works that belong to us all stay in the public domain when they are digitised. Also rejected was the attempt by the EPP to call for an introduction of an ancillary copyright for press publishers. In Germany and Spain, the introduction of such a law resulted in heavy restriction of free linking and posed a huge threat to innovation on the web with no actual gain for news publishers. The EPP shadow along with 11 other MEPs submitted an amendment saying “market-based solutions” were the answer to enable libraries to e-lend books – rejecting that libraries need a broad legal basis for lending online just like the one their offline work is based on. The final version contains no such language, insisting that the path to follow is an e-lending exception. A German EPP MEP filed an amendment explicitly lauding digital locks that often prevent users from exercising the rights granted to them by copyright exceptions. The compromise, on the other hand, unequivocally states that the right to make private copies may not be technically limited. Several amendments submitted by the ALDE group shadow rapporteur and several S&D MEPs called for you to be criminally liable if a link you share online leads to unauthorised reproductions of copyrighted works – criminalising the hyperlink, the basic building block of the internet. In the end, we compromised on omitting this topic altogether, which ensures the report does not end up making the current situation worse. The fight is not over: On July 9th, the plenary – all 751 members of the Parliament – will vote on the report. And several months later, the Parliament will start debating the legislative proposal that will be put forth by the Commission. I will continue to fight to defeat the worst ideas that slipped into the report, and demanding that the good ones be implemented. I’m counting on your support! If we enjoyed liquid democracy in Europe, you would have my vote. Carry on the good fight! Thank you for your efforts, Julia! Ein Kommentar zum Artikel: Nachdem ich die letzten beiden Abschnitte gelesen habe, hatte ich nicht mehr präsent, was eigentlich besser geworden ist als vorher. – The losses: no more freedom of panorama. – Missed opportunities: not all exceptions will be mandatory, no flexible open norm, no audio-visual quotation, no reduction of copyright duration, no public domain for works from government, mention of the unprecedented number of responses by end users be deleted from the report¹, no right to link. – The improvements: contracts may not restrict exceptions, DRM may not restrict your right to make a private copy of legally acquired content, “examine the application of minimum standards across the exceptions and limitations” (implies that some of the exceptions should be mandatory), “protection that provides for proper remuneration and fair compensation”², legal datamining of accessible works shall be legal for *research*, applies throughout Europe. ²: Vorteil hier: Schutz wird nur im Rahmen der Entlohnung definiert, nicht im Rahmen der Kontrolle. PS: “consumers have never before had access to such a wide range of creative and cultural works” — mostly because users are ignoring existing copyright laws. Julia, congratulations and thank you for this very clear description of the results and remaining challenges. The biggest being that many of our EP representatives apparently do not want to hear from us. That’s an impressive result, I’m surprised at how much of the original spirit of the report is still there. Congratulations, and thank you so much for your work ! Thank you for the effort, Julia. We are already ‘lobbing’ our spanish MEPs from Wikimedia España, against the amendment re. the Panorama ruling. Against free copying by education organisations, since HMRC have now added VAT to the price of e-books and its been hard work to sell any e-books without a price increase. Thank you, Julia! Keep fighting for all of us. I hope you manage to tone down the absurdity of the free panorama problem. It would seem so many politicians don’t actually understand the consequences of what they think they want… As a writer, I am interested in sensible copyright provision, in the ability to lend e-books, and in teaching people the difference between piracy-for-profit and cultural sharing. As a member of the UK Pirate Party I am following your campaign with hope and admiration. Thanks for your supportive words! I’ll make sure Julia reads them. I don’t support your views but they are always provocative! Thank you for the effort and great work, Julia! We, the Portuguese Librarians Association, are already ‘lobbing’ the portuguese MEPs. Yes great work between people who sometimes refuse to see what they are really being paid for.